In this June. 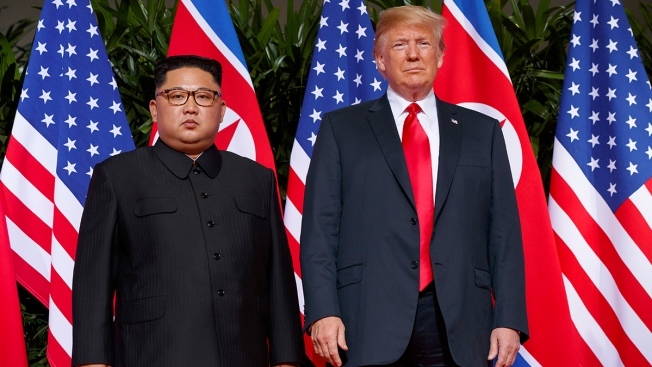 12, 2018, file photo, U.S. President Donald Trump meets with North Korean leader Kim Jong Un on Sentosa Island, in Singapore. President Donald Trump said Tuesday that he will hold a two-day summit with North Korea leader Kim Jong Un Feb. 27-28 in Vietnam to continue his efforts to persuade Kim to give up his nuclear weapons. Trump has said his outreach to Kim and their first meeting last June in Singapore opened a path to peace, but there is not yet a concrete plan for how denuclearization could be implemented. "Our hostages have come home, nuclear testing has stopped, and there has not been a missile launch in 15 months," Trump said. "If I had not been elected President of the United States, we would right now, in my opinion, be in a major war with North Korea.